The sketch shows some unusual work made with a carpenter's pencil. If the flat lead is notched with a three-cornered file (Fig. 1), two parallel lines may be drawn at one stroke, or various rulings may be made, as shown in Fig. 2. Broad lines can be made, as shown in Fig. 3, or unequal widths as in Fig. 4. In Figs. 2, 5 and 6 are shown lines especially adapted for the bookkeeper or draftsman. 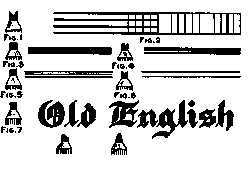 If one lacks the ability to draw old English letters with a pen, the letters may be first drawn with a carpenter's pencil (Fig. 7) and the outlines marked with ink and finally filled in. Narrow lines are made with points cut as in Figs. 8 and 9. A little practice with the carpenter's pencil in making these letters will enable the student to finally produce with the pen used for the purpose.